To add a sensor manually, select Sensors | Add Sensor from the main menu. Then an assistant will appear, leading you through two steps. For a faster setup, you can select Add Sensor... in the context menu of a device to which you want to add the new sensor. This will skip the device selection and take you directly to step 2. The Add Sensor dialog appears. The Add Sensor dialog helps you choose the correct sensor (see screenshot above). Shortlist the sensor types by choosing appropriate criteria. 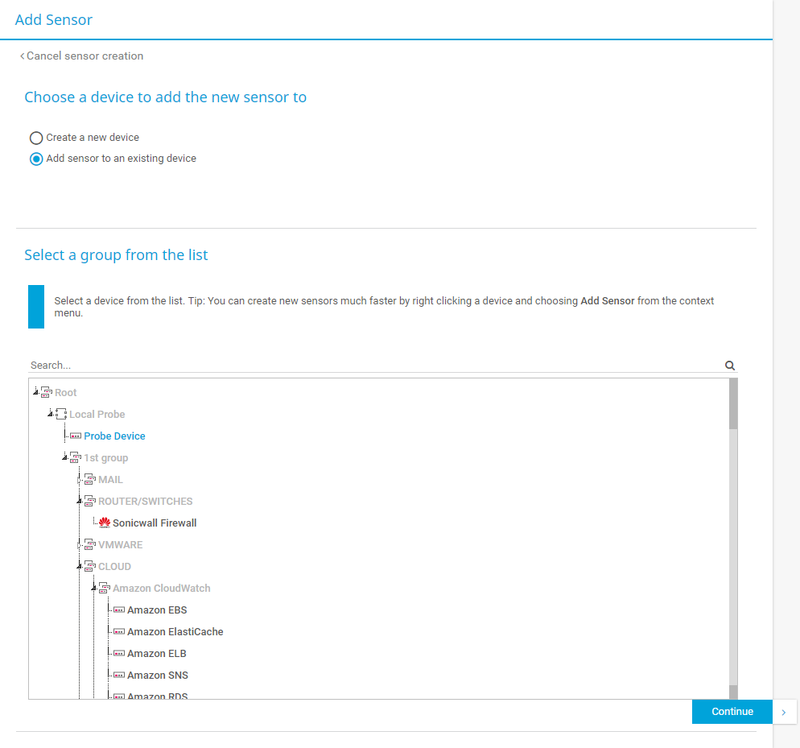 Note: PRTG suggests sensor types to create on the selected device. This recommendation is automatically calculated based on the current user's sensor usage and shows the ten most commonly used sensor types (if enough sensor types are already in use). Note: If you are unsure which sensor type will provide the information you require, then we recommend that you use the filter categories to progressively narrow down your choices. Select the type of parameter you want to monitor via “monitor what". Specify the type of target system you want to monitor and see what sensors are available for this type of hardware in “Target system type”. 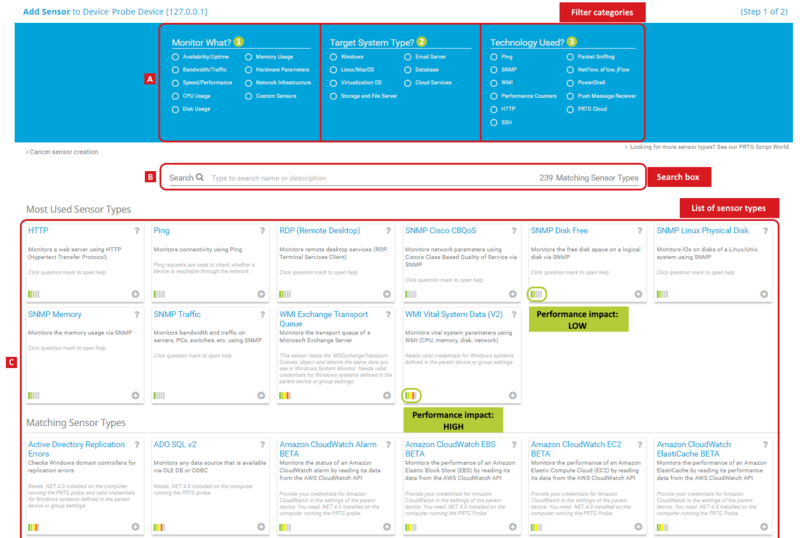 Choose the technology which you want to use for monitoring (for example SNMP or WMI) in “Technology used”. Note: Please also consider whether a sensor’s performance impact is high or low by checking the bar in the lower left corner of the sensor box. For further information see the More section below. PRTG will now create the sensor. The device's sensors list opens. For more information about a sensor type, please see the manual section of the respective sensor (directly accessible via the “?”-symbol in the top-right corner). You can also go to the List of Available Sensor Types section to find a comprehensive overview of sensor types.